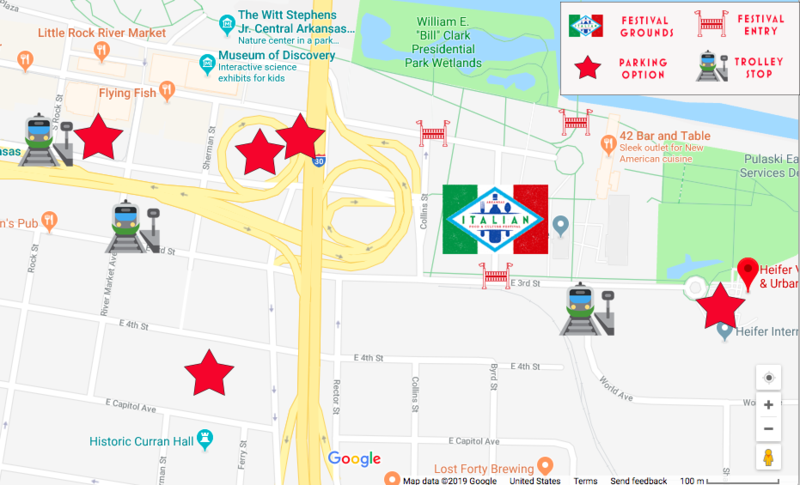 Italian Food & Culture Festival 11:00 A.M. – 5:00 P.M. There are many parking options in the Clinton Library area. Heifer International will be providing paid parking on their campus with a donation going back to the Boys & Girls Clubs of Central Arkansas. Also available is the River Market parking deck, parking along Ferry Street, parking along World Avenue, parking at the Main Post Office, as well as the parking lots located at Clinton & Ferry & the eyeball lot on 2nd Street between Sherman & Ferry. Patrons can also ride the trolley, which has a stop right in front of the library at 3rd & World Avenue.